Earlier this year, Archinect brought you the Michael Jackson Memorial Competition . Now let's turn our focus towards current events and delve into the strange intersection of religious rights, freedom of expression, and architecture. This is an open call for ideas to help Switzerland navigate its recent difficulties with minarets. We look forward to your proposals. After December 18th, a representative selection of the proposals will be featured here. On Sunday, November 29th, 2009, the citizens of Switzerland overwhelmingly passed a referendum banning the construction of new minarets in their country. With this move, the ban will be added to the Swiss Federal Constitution – a new and dubious level of status for an architectural element to reach. Optimistically, let’s put aside questions of religious persecution and think about this as a design problem: what are the tensions within the built environment that made this ban possible? When the law is a flaw, what does design offer? This is a tale of equality in confrontation with equanimity. On the one hand, the right to religious freedom should include reasonable material expression: every church with its cross, every mosque with its minaret . On the other hand, the atmosphere and image of Switzerland’s picturesque Cantons are so finely crafted and manicured that formal deviation disturbs the calm. After the lengthy discussion below we're scratching this part out in an effort to broaden the variety of proposals. Entries must be submitted as a single image that depicts both the deployed and hidden states. Entries must be added to the Switzerland, We Have A Problem group pool on Flickr. 1. Get yourself a Flickr account. 3. Navigate to this page to add your image to the pool . All entries must be submitted no later than December 18 at 11:59PM Pacific Standard Time. OK, so not every mosque has a minaret (actually there are only four in Switzerland), but every mosque should have the option to have one. Wow, just wow. Archinect, way to get everyone actually thinking about this issue rather than falling back on kneejerk reactions. Fantastic idea! that's us beeing (more or less) neutral. -we have a direct democracy here. so national desicions can be taken to the people (not the politicians). -the discussion was taken from a socio-cultural level (where i see architecture), to a religious-political level. so with the ban, a fear is expressed. a fear made in NYC, Iraq, etc. For switzerland (and most -or even all- western countries): a fear of the unknown. the question is how you integrate and/or blend. E.g. : What does that mean for the five daily calls for prayer? Is that imaginable in a non-muslim country BANNING minarets. btw: me personally, I'm heavily disappointed by last sunday. as i alredy said, the discussion was taken too far. which is a pity! we have a lot to do. here and everywhere! well, at least I did go vote. I found the Swiss ban of minarets really comical (scary at the same time) Banning the minaret is almost like banning a veranda at a house, ridiculous yet serious -and shows the severity of the situation for muslim people living in Switzerland-. I guess comedians might have quite a source in using the Swiss fear of Islam. Having said that, coming from a dominantly Muslim country (Turkey) I also look forward to see what would come up as alternative representations for today's mosque/minaret. Everything should be open to discussion:design of the mosque -as well as the ban of the minaret-. Even though it can be offending to put it this way -already accepting the ban without discussion and using it as the starting point- but the tone of humor in the call for competition is necessary to handle the current situation -as previous commenter 'Chris' also stated. i see many holographic/ beam of light minaret proposals on the horizon. a. To position (troops) in readiness for combat, as along a front or line. b. To bring (forces or material) into action. Why such a military connotation to such a sensitive subject? we're in the age of ubiquitous minarets. Every cell phone and radio can function as your own personal call to atheism or prayer if you care! so who really needs the physical structure that has such a limited geographic reach anyways when the network is boundless? I kind of agree with treekiller, an iphone can be a very good design for a minaret. anyway it is an issue on more than one layers so it cannot be reduced to a design option only, probably we should have to look in (in a broad and open minded sense) to what a minarets role is. "Your task is to design a deployable minaret that can attain full presence, visible from a distance, during each of the five daily calls to prayer. You may use any technology you like, choose any site in Switzerland, and your minaret may reach any height so long as it’s at least twice as high as the building it sprouts from." i'm assuming that a 'deployable minaret' would essentially be a sort of strap-on that could be indiscriminately thrown onto any structure, regardless of purpose or pre-existing regional or aesthetic conditions. 'full presence' and the ridiculous requirement that it be 'at least twice as high as the building it sprouts from' would appear to remove subtlety from the equation, requiring something that's more antagonistic and reactionary in a juvenile manner, rather than taking the opportunity to employ discretion, taste, and abstraction as methods with which to bridge the divides between the two communities. after all, i think one needs to consider how hideous the minaret that sparked this entire arguement is, in wangen bei olten. i wouldn't want that in my alpine line of sight, any more than i would a baptist megachurch or the garish WATCHTOWER sign in dumbo, brooklyn. i think the proper approach would be proposing something simultaneously easy for worshippers to identify that also presents an appealing visual effect for non-worshippers in its environs, rather than inviting proposals that offer a giant middle-finger to those who may have supported the ban for racist reasoning. if i enter this, i'll have to probably disregard these guidelines, and enter with the knowledge that it will probably disqualify me, but also knowing that a dialogue is always more fertile ground for an ideas competition than furthering bombastic overstatement. Something no one has mentioned is the fact that none of the 4 minarets in Switzerland actually broadcast the call to prayer. Designing a minaret only deployable for doing someting mosques currently don't do with their minarets anyway seems to be a suboptimal way to address their needs. Perhaps better research into what the swiss muslim community want / use them for might have led to a brief with more practical utility. ha ha, very funny picture up top. minarets as blades in a swiss army knife..."stop, i stab you with my swiss army minarets...die you non-swiss muslim...[stab, stab] die already"
ulterior- I think you missed the footnote above. " OK, so not every mosque has a minaret (actually there are only four in Switzerland), but every mosque should have the option to have one." puddles...once again over the line! Your comment is in very poor taste. that image (portraying minarets as knife blades) is in very poor taste given the discussion at hand. frankly, i'm rather surprised archinect would publish it. I too think this for-the-fun-of-it ideas competition legitimizes a ban based on prejudice. It's a slippery slope when we accept something as a given. the ban is on the construction of Minarets, I wonder if that should be understood as a ban on minarets OR a ban on any strongly visible symbols of the religion. There might be another mosque which decides to build a visibly large dome or a huge crescent on the front... another possible row? an interesting design problem still: but are we really designing a minaret... or mitigating Islamic symbolism and what it has come to mean to non-muslims in recent years? nothing, Are you some sort of mega-archidork or what? Sorry, but I find this 'competition' a little to tongue in cheek. It's important to note that this is not a competition, it's a call for ideas. Although the detail-oriented may notice that the URL for the flickr group does include the word "competition," this is an artifact from an older draft of the conversation. By launching a call for ideas, Archinect is hoping to collect the widest possible variety of responses and it will be up to this community, if it so chooses, to debate the merits of each. Criticism is OK, but let's keep snark and racism out of this thread since it's a sensitive enough topic as-is. @randomized: "deployable" is also an important word in the phrase "deployable structures," which was more our intention. [ intrans. ] (of troops) move into position for such action : the air force began to deploy forward. bring into effective action; utilize : they are not always able to deploy this skill. 1 forces were deployed at strategic points: position, station, post, place, install, locate, situate, site, establish; base; distribute, dispose. To reiterate the framing of this call for ideas: Can you design a minaret as event rather than object? "overwhelmingly passed a referendum", of Switzerland's 7.6 million residents about 4 have the right to vote, half of them do so usually, and half of that half voted for the ban, that is roughly a million. Muslims are a little less than 400 000 (0,5% compared to 0,8 in the US). "let's keep snark and racism out of this thread since it's a sensitive enough topic as-is." But your initiative, this call for ideas itself inherently suggests to many people that you are not interested in answering / taking a stand on the ethical question of freedom of religion and civic equality which this ban bears. You cannot expect to let this slip by without Archinect itself coming under racism-related criticism for 1) portraying minarets in the graphic above, and 2) "putting aside questions of religious persecution". Since when do we put aside questions of persecution? I simply think you could still have an ideas competition on this topic, but at least have the backbone to frame it differently, with an ethical stance. Muslims are a little less than 400 000 (0,5% compared to 0,8 in the US). Sorry, this is 5 % and 0.8%. jawasdi, this call for ideas is a method for asking questions / opening dialogue -- we aren't trying to force any answers. if you want to critique this premise in your submission, we encourage you to do so. "The referendum, which passed with a clear majority of 57.5 percent of the voters and in 22 of Switzerland’s 26 cantons, was a victory for the right. The vote against was 42.5 percent. Because the ban gained a majority of votes and passed in a majority of the cantons, it will be added to the Constitution." Quoted from the NYT article linked above. @jawasdi- our intent was to frame it as an explicitly architectural and productive discussion. We could definitely have an ethical debate here, and there has already been a bit of that discussion in the forums as well as many other places around the web, but the call for ideas is an attempt to look for specifically architectural responses to the issue. This is, after all, a forum of architects. What can we contribute in our role as designers that is in addition to or beyond our opinions as citizens? How may our understanding of the built environment potentially change or affect political decisions? 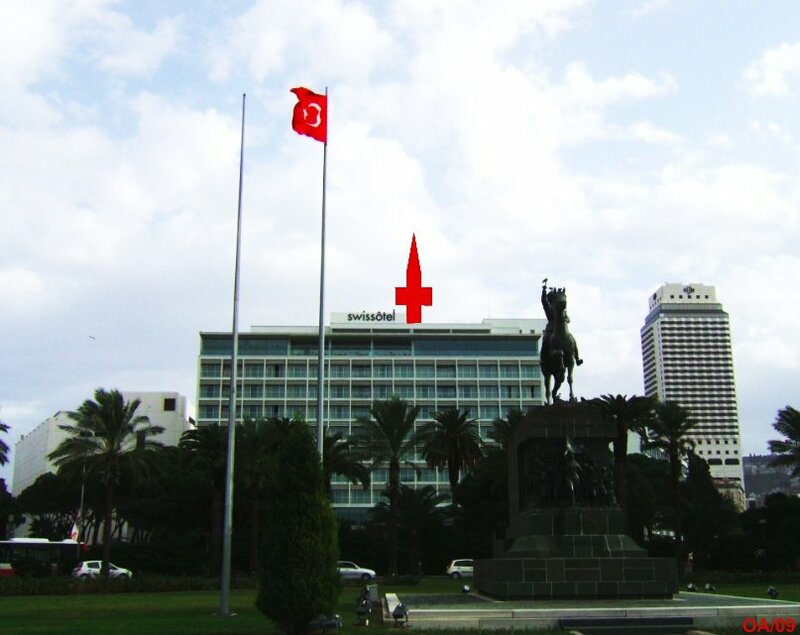 As for the image, it's a fair enough to criticize that the minarets are collaged into the context of a swiss army knife. But the thing that makes a Swiss army knife unique from all other knives is its deployability and utility for all sorts of things non-destructive. Tweezers, screwdrivers, and files are not inherently antagonistic. A Swiss army knife may still be a knife, but it's definitely not the sort of thing anyone would want to take into battle to defend themselves or attack others. Is the image provocative? Sure. My guess is that no image at the top of this page would be without criticism from someone. "Optimistically, let’s put aside questions of religious persecution and think about this as a design problem: what are the tensions within the built environment that made this ban possible? When the law is a flaw, what does design offer?" "Optimistically..." e.g. let's give Switzerland the benefit of the doubt for the moment, as a thought exercise. "When the law is a flaw, what does design offer?" This seems like a fairly clear statement that the brief fundamentally considers the ban to be problematic. Not to mention the title of the call for ideas itself: "WE HAVE A PROBLEM" ! But to bring it back to the question of architectural specificity, "what are the tensions within the built environment that made this ban possible?" If this were a question of purely religious persecution there would be a ban on the Islamic religion ! What is it about Switzerland that makes the minaret the pivotal symbol of Islam? Why architecture and not clothing such as headscarves? The minaret may very well be functioning as a synecdoche or symbol*, but what pressures does that put on architecture – and on us as a community of architects? How will architects practicing in that country deal with the fact that this is going to be part of the Swiss Constitution whether they like it or not? How would you deal with it if you were commissioned to design a minaret in Switzerland? Your clients want it, the law forbids it, what's an architect to do? Changing the law is one option, and personally I think the right option, but that's a long process. So what happens in the interim? * Which you can criticize in its own right. And yes, I personally find this troubling. A Swiss army knife may still be a knife, but it's definitely not the sort of thing anyone would want to take into battle to defend themselves or attack others. The image reminds me of a truly gaudy wedding cake from Las Vegas. also, i think there is far too much emphasis on the minaret/islam question. the bigger issue, in an architectural sense, is "what is swiss?" obviously minarets are now out, but what else is at risk of being excluded? the minaret ban is really just a sideshow. there only four of them there already, really? 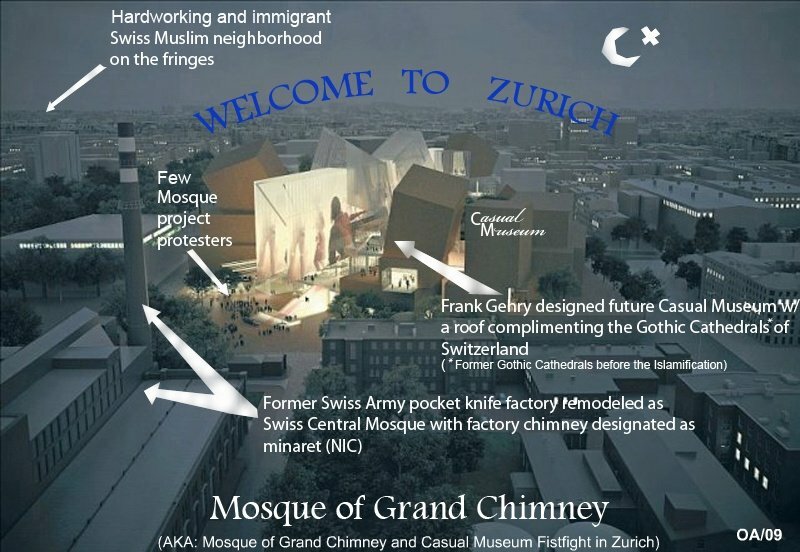 i doubt that there is an influx of proposed minarets in switzerland. on the one hand this is a non-issue and as worthwhile as the United States passing a ban on martians (because heavens knows we have a problem with that right now). on the other hand, and i could be wrong here as i'm not swiss but i suspect that most of those voting in favor of the ban are more concerned with maintaining their rather pleasant built environment than they are with religious intolerance. at the moment, perhaps this has been exploited by the far right politicians...but who else will soon see fit to exploit this swiss concern for their environment with additional bans on architectural elements that are considered unswiss? could an environmental group/green party, for example, propose a ban on skyscrapers as being unswiss? i don't know. i hope my earlier comment isn't construed as part of the 'snark,' and i'm genuinely interested in the manifestation of this 'call for ideas,' because i think the topic itself is pressingly relevant and fertile for architectural imagination. to clarify, though, i was a little frustrated with what seemed to be a preconceived stance written into the guidelines, and bryan seems to have clarified that to a degree. "According to Alexander Ruch, professor of building law at ETH Zurich, there is so far no official definition of minarets,"
but that really is a minor item, considering, and i look forward to the outcome of this event, especially if entrants bend the 'rules' creatively. "On the other hand, the atmosphere and image of Switzerland’s picturesque Cantons are so finely crafted and manicured that formal deviation disturbs the calm." This is ridiculous, first of all because it's giving credence to the conservative excuse for the ban, which is a really transparent ploy, and second because many minarets are very elegant and minimalist (especially the one in the picture accompanying the news stories), and look perfectly at home in Switzerland. I love the impulse behind this contest but I think confronting the real reasons for the ban will lead to more inventive results than accepting the cover story. @roller: this might sound like me being a jackass, but I am asking an honest question... what would an architectural response to "the real reasons for the ban" look like? Is architecture the proper response to racism? I'd suggest that architecture is a pretty weak response to racism. Even though I find the ban problematic, it remains an interesting situation: why is an architectural element bearing the brunt of the discrimination? Why not, as I asked before, headscarves? And if you do figure out a way that an architectural proposal can address "the real reasons for the ban," please feel free to submit it even if it breaks the rules of the call! bryan, do you "believe" race and religion are the same ? no, good point, I was typing too quickly before. but I do believe that discrimination based on race or religion are equally deplorable! "why is an architectural element bearing the brunt of the discrimination? Why not, as I asked before, headscarves? there's a permanence involved with architecture. i can go to switzerland and see headscarves and just assume that they are other tourists. even if the place it swarming with them i chalk it up to bad timing (maybe a convention is in town, whatever). but...if i start seeing minarets, then i know it's no longer the switzerland that i've come to see. it's no longer the switzerland that i've seen in postcards, no longer the switzerland others have told, and/or possibly no longer the switzerland that i remember from previous visits. and although it's clearly a different experience for fulltime/permanent residents & citizens of switzerland, i suspect that they would acknowledge some congruency in my sentiments. people are clearly feeling a bit touchy about the race & religion and are quick to bite into this law from those perspectives. but there is also a significant branding issue at play. i've said before that nobody really wants to see minarets in switzerland (making this whole thing kind of a non-issue in the practical sense). in the same way, nobody really wants to see prada available in walmart either. it's not necessarily fair that if i live in iowa and even if i have $1000 & am willing to spend it on the designer loafers that i can't and have to travel to new york instead. but it's part of the price we pay for choosing where we live. geography is not fair. @nothing_engine: you make a good point. After some editorial discussions we've removed the height requirement. As such, the call is now open to any idea that presents the minaret as event. ^^Guillaume Morand completely gets it..
My name is Wael Zain al-Abdeen I'm from syria I have an idea to fix is problem . My idea is to build a ligneous glassy minarets with a special design , so it can be lighted in the five times of the pray and lightless in the other times . One problem here is the way the solution has been framed.
" ... the atmosphere and image of Switzerland’s picturesque Cantons are so finely crafted and manicured that formal deviation disturbs the calm.."
"... and the value of Switzerland’s overwhelmingly scenic environment." This is a religious position itself. It's just a statement of belief in the virtues of romantic pastoral tranquility. What's wrong with a regular minaret? Why does it have to be reinterpreted by the latest fashion designers? How does a minaret damage the environment? And the exact same thing happens in the US all the time. Every day, with the approval of finger-wagging architects who criticize this style or that style or someone else's style. "What's wrong with a regular minaret? Why does it have to be reinterpreted by the latest fashion designers?" The egomania of the design superstar self proclaimed genius architects against the symbols of religions. This is sure fun to watch! Hey. I am wondering if anything is ever going to happen with our proposals/ideas. Some of us have actually put serious thought, meaning and work into this and I must say i'm quite disappointed about how this call for ideas competition is being handled. Not a single word since the due date... Not very professional I'm sorry. As mentioned above, a sampling of projects will be highlighted here. With the holidays it has been quite hectic but rest assured that we will be posting a wrap-up soon. But don't let that stop you: the entries have been available for all to see on the Flickr group pool since day one. Dig in! Have you ever entered a professional design competition before? What is it that you are expecting, exactly? I am just expecting some feedback and appreciation. A short blog notice saying "thanks for your entries" is not too much to ask for i think. And yes i have entered a lot of architectural competitions in germany and europe, which are highly professional. And yes, it very seldom happenes that you hear anything or get any feedback unless your proposal is amongst the top 10. But there are large sums of money and often enough a comission for a building involved, so the anymosity is the key factor here. None the less this is not the kind of professionalism i am talking about. Running a blog like this is a professinal process, the key factor here being communication, which there hasnt been since the 18.12.09 up untill now. I hope I could help you to understand what i am talking about. How about if Paul gives you a reach around? The proliferation of self worth and lack of humility on archinect is astounding.